Broken, originally uploaded by electrolyte2006. Regular readers will recall that I had problems with my 50mm f/1.8 lens in the past. I stupidly bought the lens from a website in Hong Kong called One Stop Digital because it was cheap and I had real problems getting the lens replaced. Well, 5 months after I got a replacement the lens has broken. And unfortunately One Stop are denying that it because of a fault with the lens even though that is exactly the reason why it has broken. When I was in Paris a couple of weeks ago I took the 50mm lens off my camera to replace it with my 18-55 lens. 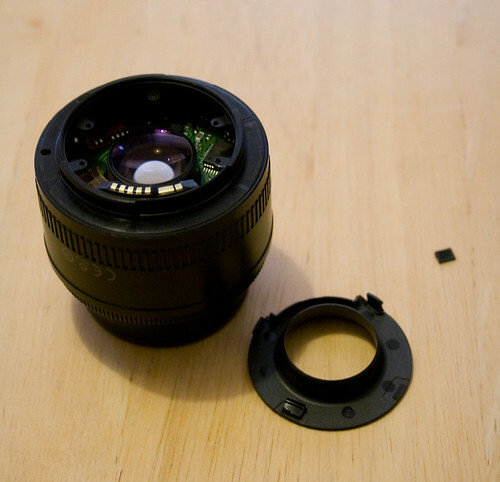 Unfortunately when I unscrewed it the lens fell apart into two bits. The central glass section separated from the plastic outer section. The lens was in two pieces. A 5 month old lens is not supposed to do this. I would imagine most people would agree with me that this isn't supposed to happen with a 5 month old lens! Because I wanted to use the lens I tried to fit it back together. I managed to fit the two parts of the lens back together again but once I had done this the autofocus made a grinding noise and the focussing did not work correctly. The central glass section was also at a slight angle (it was impossible to get it to fit back in completely straight). I kept the lens on the camera until Saturday when I discovered that the lens was stuck on the camera and was almost impossible to take off. I had no choice but to force the lens off. And when I did, the bottom bit of the lens snapped as you can see above. Unfortunately One Stop think that I have broken the lens through misuse and this is not a result of a fault so this isn't covered by the warranty. They said that I should send the lens back to them - at my own expense I should add - and they will send it to Canon Hong Kong for Canon to decide if there is a fault. Problem is, this is what they did with the first faulty lens they sent to me. The lens front-focussed badly yet Canon claimed that there was no fault with the lens. I figure that the same thing will happen this time. So I think I will cut my losses and buy a better lens to replace it with. I really love taking low light moody portraits and so need a low light lens. And having so many problems with Canon's budget 50mm lens I think I will use some of my savings and blow it on a 50mm f/1.4 lens instead. And this time I will buy it from a UK shop so if it goes wrong I can at least take it back. Sorry to hear that. I have a friend selling a 50mm f/1.4 if you are interested. He wants £200.00 all in - immaculate condition, filtered and boxed. Thanks Pete - I'd be very interested in that. Please could you send me your friend's details so I can contact them?